LAS VEGAS, Jan. 5 -- At the 2005 Consumer Electronics Show, Eastman Kodak Company is showcasing the newKODAK PROFESSIONAL 1400 Digital Photo Printer, an affordable system for professional and Advanced Amateur (AdAm) photographers that delivers outstanding quality and durability of KODAK prints immediately. Whether in a studio or on location for proofing or at home for final printing and displaying, the robust desktop printer produces one 8x12, one 8x10, two 6x8, two5x7 or four 4x6-inch photos per sheet, and the water-resistant photos last a lifetime. The KODAK PROFESSIONAL paper and ribbon consumables are bundled in matched volumes to provide optimum color density for every print, eliminating worries associated with low ink levels. Consumables�including paper available in 50- and 25-sheet packs�are priced competitively to similar offerings on the market. "The KODAK PROFESSIONAL 1400 Digital Photo Printer is yet another way that Kodak satisfies professional and AdAm photographers� need to print digital photographs in studio, on location or at home," said Sue Gringer, Worldwide Marketing Manager, Digital Desktop Output, Professional Output Group, Digital and Film Imaging Systems, Eastman Kodak Company. "The affordable, easy-to-use printer produces high-quality, durable output that makes every print worth framing." The printer�part of the venerable family of KODAK PROFESSIONAL thermal printers that includes the ML-500, 8500 and 6800 printers�comes with a one-year warranty. 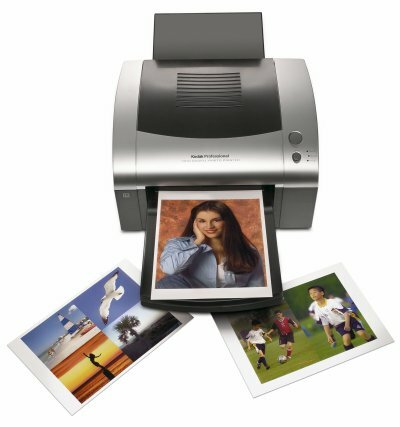 The KODAK PROFESSIONAL 1400 Digital Photo Printer carries a suggested U.S. list price of . It will be available in October from authorized dealers of KODAK PROFESSIONAL Thermal Printer products.